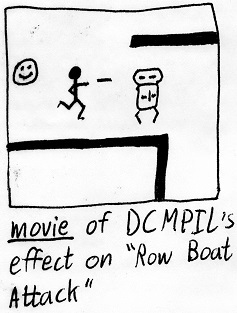 Copyright © 1981 by Roger M. Wilcox. All rights reserved. The original draft was written on my dad's mechanical typewriter, accompanied by hand-drawn illustrations — such as they were. Every image you see was scanned in from the original, although some pages suffered water damage over the years. All non-image text was transcribed in exactly the format it originally appeared. The lack of an = key on the original mechanical typewriter means all = signs were originally written in by hand. All spellings, punctuation, capitalizations, etc. are as in the original. 6. ANOTHER STAR-TRAK GAME -- Surprise, 80-micro! 10. SMALLDOS -- Howza bout a DOS for a 16K femtocomputer?! 14. DICE SIMULATOR -- 80-femto's biggest program ever printed! 16. CAPTAIN TAPEDRIVE -- The Creped Avenger strikes again! 21. DECOMPILER -- slow down thas speedy CMD program! 25. THE DUKES OF M*A*S*H -- Car chases in Korea. 3. 80-REMarks -- non-existing mail about our first issue. 33. REVOLT! -- Start your own Communist country. 35. BLINKY, PINKY, INKY, and CLYDE -- a fast, all-BASIC Pac Dude. with the sound and graphics -- don't you? on a Sunday drive in your jeep. With bad sound! │ GOBLIN │     Here we go again with another version of Pac Dude! our hands on "Blinky, Pinky, Inky, and Clyde." │ATTACK │      24 hours a day for ten years! I must have gotten a bad copy of your Septober 80-Femto. Tell me, what was on the last page? Oh, just a description of Duel-M-Droids. Hey, ya wanna buy a joint? No thanks. I'm not interested in purchasing a bar or pub. "Empire Wars!". Just what kind of program was it, anyway? Who knows. Probably someone's feeble attempt at Android Numb. 'cause like, my head is twisted sideways, totally. Thanx, man! You're from Southern California, right? my fond farewell to the world, as with this issue, I explode. Oh yeah? You and whose army?!? ing with a mind of its own! Try: POKE 564893, 784.
what you need to change: M 435A 36 00.
leading you to a large combined hoarde. With sound effects! effects include, "Your money or your wife," "Hand it over, Joe,"
and "The government'll get you for this!!!" This advertizement continued next paige?!? Didn't think we'd market a program like this one,did you? attachment in addition to the Crayon-kit color modification. back a note saying, "Curiosity kills the cat." idea came into my head to write my own version of Star-Trek. few new ideas of my own. which I appropriately named after the title on this very page. manure knows the meaning of the words, "Another Star-Trak Game." crashed (we've got this thing down better than Space Vaiders!). here -- you're really in southern California! With smell effects! available infinity K of RAM, but was none the less fantastic. entry point header code (whatever), and the entry point (00H). The resulting program caused an immediate jump to "MEMORY SIZE?" "Now, you too can pretend that you own a TRaSh-80 femtocomputer! down to the last minute detail! With optional sound!" Tired of the same old boring, routine ASCII computer code? good-bye to the real world and your graphics forever. So, you finally went out and got yourself a desk drive. of memory expansion kits has been outlawed! like DOS and CMD space? The answer is simple: get yourself a smaller version of DOS! But where can you find a DOS that takes up such little memory? DOS does have quite a range of capabilities. Not the least of these abilities (that are caped) is Unbug. commands to JPIR, whose code, by the way, is ED FQ hexadecimal. "Scrunch and Concentrate," or at least one of the two. probably already aware of and doesn't need to be informed about. the command "Device," which is just as useless. chip you wanted to glop so badly. │                       │ their license plate"
Another Star-Trak Game -- new and improved - I hope! Interception -- wow! It even saves the high score! 1 pm and 1:05 pm. dice out of a crap game monopoly set, and needed a replacement. looking for: a random number generator! This little 22 byte program can be of use to almost anybody. how or why he was put there. And if you believe that, I have some snake oil to sell you! This is Scott Adama's latest excursion, Mongoose Adventure. has to hold his breath and open his eyes. With sound effects! Remember the review a few pages back? Well, here it isn't! ground and pull out a C-30 cassette?!? or Avenger Irrational, I'll continue my stream of gibberish. tape drives break down, Captain Tapedrive remained standing. tected was a little piece of hardware called, "Level II ROM." the TRaSh-80 at first, but after a while he got used to it. was more than twice the size of Captain T.D..
CLOAD and CSAVE he had known and loved would surely die. marked, "Ha, Captain T! This is a Disk Drive!" How about that. A bullet with his name on it. In the distance of another room, the front doorbell rang. the air and landed on his benevolent prey. not for his own high speed. ware. A bit banged up, but who'd notice. a little time to get acquainted.' If he only knew. to it and say, "Someday, I'm gonna crash you!" "Now, little CLOAD command, you will DIE!!!" said only one thing: "FASTER!!!" getting rid of you once and for all!!" TRACK BALL: great for rolling around on footprints or train rails. PURPLE SCREEN: is green too boring for ya? BLACK SCREEN: to hell with that CRT display! real Exxonerators and Kluster Chucks. little disassembler is absolutely no help at all! assembler or just play the games. for them, we have the "Decompiler." program and converts it not into Assembly, but actual BASIC! into the registers H and L, you can start to see the problems. Each decompiled program begins with the statement DEFINT A-Z. machine language program will fit into 10K once decompiled! just like you'd expect it to - in reverse. ility to run your own programs in a "BASIC on top of BASIC." case, you probably have a bad memory chip or CPU. too much time to decide on my next move. Not the same as "Williams"
right? Well, you're wrong! It has no Adventure in it whatsoever. Beau, and Roscoe) who know how to say only one like apiece. Logg, but then again, you'll also be the slowest. B.J. : Hey, Hawk! How ya doin'? BEEJ: Yeah, I know, Hawk. That's all you've ever told me! TRAPPER: Yeah, and me too! BEEJ: Hey! You're not supposed to be on the same shows with me! MICROWAVE: What did you say sirs that you just said? MICRO: Okay. Hawkeye Pierce, sir? MICRO: Okay, got it! I'm sure that'll cheer the patients up. BEEJ: Knowing that people are dying is gonna cheer them up? will, though. --Oh no, choppers! KERNEL POTHEAD: What choppers? I don't hear anything! BEEJ: ...I don't think it's choppers, Kernel —— look! POTHEAD: Great Horny Toads! A commie car! POTHEAD: Well, it's red, isn't it? BEEJ: No, no, it's orange! You're getting to be like Frank. MICRO: What do you think they'll say to us, your kernelship? BEEJ: Funny, that's what I thought they'd say, too. DUKE: Hi! I'm Duke, and this is my brother, Beau. BEEJ: Does he know how to say anything else? DUKE: Yeah; sometimes he preceeds that mess with, "Let's do it!" BEEJ: Monomania. He's crazy about mononucleosis. so why don't you just skeedaddle, pronto. DUKE: Well, whadayaknow! He speaks our language! BEEJ: Oh yeah? Well, where are you from? BEEJ: Well, then, what are you doing in Korea? DUKE: KOREA!?! I knew we should've taken a left at the Alps! MICRO: AAAH! Help, your Kerneldom! KERNEL P: Say what, boy? I ain't goin' near that thing! DUKE: Don't worry. That's just Sherriff Roscoe M. Coalmine. BEEJ: Is that so?!? Well, what are you doing here, Roscoe? BEEJ: What are you talking about? It's summer time! BEEJ: Not quite...We're under attack! BEEJ: Funny, I didn't know Frank was a monomaniac, too. POTHEAD: Wait a minute! Those aren't Communists! BEEJ (With a look of "Oh, my God!" on his face): Oh, my God! you figured out what's happening yet?!? ALL: WE'RE UNDER ATTACK BY TRSDOS 87.4!!!!!!!!!!!!!!!!!!!!!!!!!!!!!!!! the only computerish ending I could think up! puter, we took it from him, and now we have the Model VII! almost as totally alien to assembly language itself. a right-angle with this name. turn it on, and you'll see the message, "SHIP SIZE?" A Mars rover is not a dog from the planet Mars, you dip! surface of Mars, in machine-readable code, of course. to reach Mars, and five minutes for the response to come back. In the Cosmos, there are BILLIONS and BILLIONS of stars. command, but who the ---- cares? PRICE: Just get a subscription to "Pinecone Monthly". getting both programs, and watch the delays run on into hours! a part of that program in case you didn't know, you twit. NEWS FROM POKER TABKE SOFTWARE, INC.
"We guarantee our clocks will be right at least twice a day"
feated the White army, and the country soon became communist. make some sort of profit off of the few original copies we sell." remain undevulged in this article. So, after typing in "MARX WAS RIGHT!" the program begins. finding out how the game works myself! think I'd need to bother with documentation. (Moscow residents add 0% sales tax). "You might not get a bad load from Bad-Lode...."
Then, they remembered an old game of theirs called "Dodgem"
them, some of the time. case you're interested, Midway is a Japanese company, and "Pac"
80 version of this game was "Scarf Dude" by the Cornhard dudes. don't I prove that to everyone!" And so I did. I wrote "Blinky, Pinky, Inky, and Clyde,"
Page 0: And by "disks" stacked end-to-end, I meant 5¼" floppy disks. Unless you were one of those weirdos who used a TRS-80 Model II (or Model 12, or Model 16), in which case they were 8" floppy disks. This was back in the ancient times, when floppy disks actually flopped. Page 2: In going back and reading this after all these years, I suddenly realized that Bill Hoague and Jeff L. Konyu, of Big Five Software fame, have the same first names as the two male children in The Family Circus. Van Kratener was the fictional genius who figured out how to manipulate hypercharge fields in Starfighter . Back when this was written, the 213 area code was the only area code for the entire greater Los Angeles area. Not even the 818 area code existed yet. Page 3: RSM stood for Radio Shack Monitor. I think it was basically a more powerful version of T-Bug. I'll be damned if I know exactly what it did, because my TRS-80 didn't have a disk drive. Page 4: "Instantaneous Software" was a play on Instant Software, 80 Microcomputing's own software distribution company. Biff & Spudd Mutt really did write an adventure game named "Death Dreadnought," which their ads claimed was "Rated R due to graphic descriptions of violence." I played it and, frankly, nothing in it looked worse than PG. Even when the space monster rubs you against itself and devours you by osmosis. Every activity described in Disney Adventure is the plot of one of Disney's live-action movies. The million dollars in gold eggs comes from Million Dollar Duck, the last Applegate treasure comes from a Hardy Boys serial, and the string of riddles comes from a movie involving a "Pook Lantern" which shows not where you are going but where you have been (and for the life of me I can't remember anything more about that movie — I know neither its title, nor the proper spelling of "pook"). A 16¼ K program was supposed to be a terribly frustrating thing, because every Model I TRS-80 that lacked an Expansion Interface was limited to exactly 16K of RAM. The spelling of page as "paige" was more than just silliness. Up at ISOMATA in the summer of 1981, I met a girl named Paige whom I managed to get to first base with. Which was a pretty major accomplishment for me. Page 5: "Goon Cresta" was a play on Moon Cresta, an arcade video game from 1980 which I absolutely loved. After I wrote this, I actually decided to try and tackle writing Goon Cresta for the 16 K TRS-80 for real. I knew it would have to be entirely in machine language, just like Big Five Software's games were, but I wasn't worried — I now had the TRS-80 Editor/Assembler and should thus theoretically be able to code anything. Or so I thought. When I actually tried to tackle it, I balked. The complexity of doing an entire 16K program in assembly language was just too much for me to hold in my head. What I didn't understand at the time was that the assembly-language equivalent of a BASIC variable was a memory location. Had I known, maybe I could have completed Goon Cresta, and some big software publisher would have bought it, and I'd be stuck writing game programs for a living. I guess I dodged a bullet there. One thing I absolutely hated about Instant Software was their penchant for selling software that wouldn't work on a bare-bones TRS-80. Nearly everything they sold required an Expansion Interface at minimum, and many of their titles required other after-market hardware add-ons. Hence my ranting about Instantaneous Software refusing to sell Goon Cresta until it was amped up to only work with color hardware and high-resolution graphics addons. "Curiosity killed the cat" was later used strategically in my P.D.Q.-Bach-esque choral masterpiece, Gloreya in Excelsis. Page 6: If you have a TRS-80 emulator, you can play Another Star-Trek Game — spelled boldly with the "e" in Trek, the way God and Mike Mayfield intended — by downloading the .cas file here. Alternatively, you can also play a modern .NET 4.0 adaptation by downloading its .zip file and copying its contents into any old local directory on your PC. I really did submit Another Star-Trak [sic] Game to 80 Microcomputing, as an article complete with program listing, an in-universe setup for the premise, and a description of what this particular Trek game does differently than all that other Trek-game rabble out there. I even sent them a cassette they could load in so that they could see it in action for themselves. It's a pity they took one look at it and said, "A Star Trek game? Good lord, aren't there already 6.02 x 1023 of those out there?!" without giving it a fair shake. I assume. Page 7: Frank and Moon Unit Zappa released the song "Valley Girl" in 1983, which popularized Southern-California-esque speech. I wrote this issue of 80 Femtocomputing in 1981, pre-dating "Valley Girl" by nearly two years. So there. Who's laughing now, Zappa! Actual TRS-80 diskettes were 5¼" floppies, single-sided, double-density. They had a maximum theoretical capacity of 180 K per side; all Radio Shack disk drives (which established the standard that everyone had to adhere to) allowed access to a mere 160 K of this 180 K potential. So even if you flipped the disk over, it could still only store a practical maximum of 320 K. There are two possible explanations for my mention of disks that held 1200 K of data: (1) I was prescient, and accurately predicted the invention of high-density 5¼" floppies years before they actually came out; or (2) I had no idea how much an actual TRS-80 disk could hold and was making it up. Which was it? You decide! 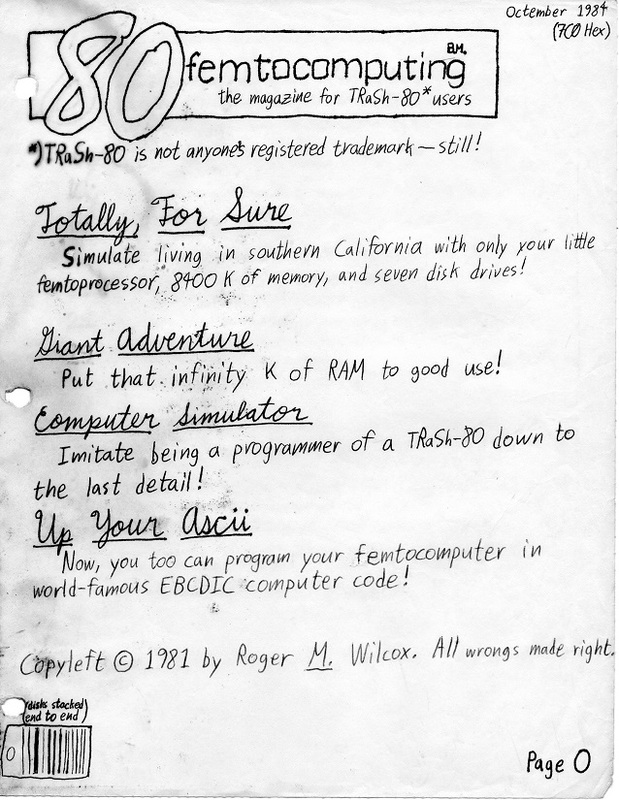 "CFS" stood for Computer Fantasy Simulation. Or Charles F. Stanley, who was associated with Zork in some fashion. I don't actually remember what it was I was referring to when I wrote this. "Greg Hassock" was a play on Greg Hasset, another TRS-80 programmer who published several text adventure games at about the same time as Scott Adams. He had a profound influence on my Adventure-game-writing oevre, twice. First, because of an article he wrote for Creative Computing titled "How to Write an Adventure", from which I learned the basics of how to code an adventure game in BASIC. Second, because of a review of an adventure of his titled "World's Edge," which talked at length about how awesome it was and mentioned that Greg was two years younger than me. I couldn't let that challenge to my budding manhood stand unopposed. It gave me the impetus I needed to tackle what I thought was impossible: Turning The Vial of Doom into a text adventure game. Page 8: I chose "SIMULA" because system filenames on a Level II TRS-80 were limited to 6 characters. I had no idea at the time that there really was a programming language out there called Simula — which was, by most accounts, the first object-oriented programming language evar. The Stringy Floppy was a high-speed (for its time), high-capacity continuous-loop magnetic tape drive made by Exatron starting in 1979. Its data transfer rate was claimed to be 14 KBPS, although Bill Fletcher describes it as being merely "ten times" faster than cassette on the Model I. (Model I cassettes loaded in at 250 BPS if you had a Level I ROM, or 500 BPS if you had Level II ROM; TRS-80s didn't get the "high speed" 1500 BPS cassettes until the Model III came along.) Despite its name, you couldn't actually access the files stored on a Stringy Floppy as though it were a real floppy drive. Page 9: PRINT CHR$(34) displays the character whose code is 34 (in decimal). In EBCDIC, this wouldn't render as "7", it would render as a "File Separator" (FS) character, the equivalent of hexadecimal 1C (decimal 28) in ASCII. On a TRS-80, PRINTing this character would move the cursor to the top left corner of the screen. If you wanted an actual EBCDIC "7" character, you'd have to PRINT CHR$(247). "Larry" probably referred to Larry Ashmun, the author of Invaders Plus (perhaps the most well-known TRS-80 adaptation of Space Invaders). "Scott" obviously referred to Scott Adams (not the Dilbert guy, the other one). Page 10: "DOS minus" was a play on DOS Plus, one of the disk operating systems competing with Tandy's TRSDOS. Page 11: The Z-80 had two machine instructions that ended in -IR: LDIR, which copied a block of memory, and CPIR, which compared two blocks of memory. Both of them had two-byte opcodes, the first byte of which was ED hex. "DEVICE" was a real command in TRSDOS. It listed all I/O Devices, which were similar to the notion in Unix or MS-DOS of an arbitrary input stream or output stream. Unfortunately, due to space limitations, no I/O devices were ever hooked up, and by TRSDOS 3.3 the DEVICE command was dropped completely. Speaking of DEF END, I actually wrote a piece of Defender (the arcade video game) fanfiction in 1982. It was called Every Fifth Attack Wave. It's every bit, as, um, "exciting" as you'd expect a Defender fanfic to be. Page 13: "Space Warrior" was my 14th adventure game, which I eventually retitled "Medieval Space Warrior." I even turned it into a story in 1982. This game, and Another Star-Trek Game, and Interception, can all be downloaded from my old TRS-80 apps webpage. I never did get up the gumption to tackle Space-N-Vaders, though. Page 15: Scott Adams' Adventure #2 was Pirate's Adventure. Adventure #11 was Savage Island Part II. Savage Island Part II had annoying puzzles like having to type BREATHE OUT when you're exposed to vacuum or you explode. Asteroid belt mining in 1984 was clearly wishful thinking. But then, even as late as age 15, I still had hopes of living on the lunar colony we were obviously going to build there soon. Page 16: "goodness and niceness" comes from Get Smart. CONTROL was the organization of goodness and niceness, while KAOS was the organization of badness and evil. Page 18: Going back and reading this story again, it's rather disturbing that I called Captain Tapedrive a super "hero." His only described action is the attempted and, later, successful murder of an innocent disk drive, for the hienous crime of being better at his job than Captain Tapedrive was. Page 19: The moral lesson of "always make backups" here was inspired by a story in another TRS-80 magazine, about a guy who got more and more high-density storage equipment and software until he could fit 60 disk's worth of data onto merely 5 disks. ("Each so dense that he had to lift it with both hands.") Tragically, during one of his bi-monthly disk swaps, it fell from his hand and his daughter accidentally stepped on it. He now has 60 disks again — the five needed for all his data, and 11 backups of each one. Page 20: "Arpha Products" was a play on Alpha Products, who used to advertise in the pages of 80 Microcomputing. They sold hardware, and one of their flagship products was the familiar joystick from the Atari 2600, modified so that it could be plugged in to a TRS-80 in some manner. They also sold green cellophane overlays for the video monitor which they referred to as "green screens." "Hollyweird" came from my Driver's Ed. teacher. I was learning in the Los Angeles area, and he regularly referred to "Westweird" and "Hollyweird." And "pestedarians." He always said "pestedarians." Page 21: Yes, "frac" [sp] is the universal swear word from Battlestar Galactica. No, that's not an anachronism. You kids today are too young to remember the original, 1978 Battlestar Galactica TV series with Lorne Green, which gave us not only "frack" but also "felger carb". And oddball units like the "centon". Page 23: "Draged" was inspired by Leo Christopherson's Voyage of the Valkyrie. One of the ten castles you had to attack in that game was named Castle Drage. I've used "drageburgers" as a curse word more times than I can count. Page 24: "lagsam" was a typo. I meant to type "langsam," the German word for language. I didn't know at the time that German requires all nouns to be capitalized, though, so even if I hadn't made that typo I still wouldn't've capitalized it correctly. Representing the humanoids in Defender with "! ", and the landers with "A", was done by a real TRS-80 adaptation named "Alien Defense." It did make their vertical movement kinda chunky. Page 25: "Aant Eater Software" was a play on Aardvark Software, itinerant peddler of such software titles as Dungeons of Death. The inspiration for "The Dukes of M*A*S*H" came from a song I heard on the Dr. Demento radio show named "Stairway to Gilligan's Island" by Little Roger and the Goosebumps. The song took the words of the Gilligan's Island theme and sung them to the tune of Led Zeppelin's "Stairway to Heaven." I soon discovered that I could take the words of the Dukes of Hazzard theme and sing them to the tune of "Suicide is Painless" (the theme from M*A*S*H) in precisely the same manner. Of course, that only worked for the verses; for the chorus, I had to add: "'Cause they're the Dukes of M*A*S*H / They run moonshine or hash / And you can take or leave them as you pleeeease...". Page 26: The misspelling of Colonel as "Kernel" was deliberate. Though at the time I had yet to learn about operating system kernels, which would have made the joke funnier. Officially, B.J. is correct about the color of the General Lee. It was painted in Chrysler code EV2, which they called "Hemi Orange". But come on, tell me that's not a shade of vermilion! Page 28: Surprisingly, no one has made a programming language named "Pythagoras" yet. Considering that there are programming languages named Eiffel, Ruby, Python, and Ada, can Pythagoras be far behind? 5746 Sunset Boulevard was the mailing address for damn near every TV show produced in the Los Angeles area, at least while I was growing up. Especially the game shows. Page 29: Since this article was written in 1981, several semiautonomous rovers have been sent to Mars. NASA even has an online Mars rover simulator, but it appears not to work with Internet Explorer version 11. At least, not for me. CALL 01C9H was a call into the CLS (CLear Screen) routine in TRS-80 Level II ROM. A lot of machine language programs started with it. 4A00H was the preferred address to start a machine language program at, if you were planning to debug it with T-Bug. However, large programs needed every byte of RAM they could get their hands on, and for them 4A00H was way too high an address to start at. A more desirable starting address was 17129 (42E9H), the start of BASIC program space. Page 30: My labelling of Toledo, OH as "no-man's land" was inspired by the song "Saturday Night in Toledo, Ohio" by Randy Sparks (as sung by John Denver on his An Evening with John Denver album). It includes such immortal lines as "All through the day, how the hours rush by / You sit in the park and you watch the grass die." Page 31: "Poker Table Software, Inc." was a play on "Kitchen Table Software, Inc.", the 80-Microcomputing article that inspired the entire 80-Femto line. Kitchen Table Software, Inc., or "KTI", was a fictitious software company made up by David Busch, which sold DrossDOS 1.0 and ran a dial-up network called HAIRnet. Their software ran on the Sri Lankan version of the TRS-80, called the TLS-8E. (Insulting to native Asian language speakers? You bet!) The owner and operator of KTI wished for his identity to remain a secret, so naturally the very next line of the article mentioned that his name was Scott Nolan Hollerith. Magma Man, Mine Man, and Maze Man came from a dream I had. They were super heroes — or super villains — who fought each other. Magma Man was made out of molten lava, and could hurl molten lava at his foes; I eventually wrote him up as a Champions™ character. Mine Man was a beatnik who rode around in a mine car; if he needed to attack you, he'd say "Cool!" and then start throwing shards with each hand. Maze Man was the "hero" from the video arcade game Berzerk; I called him "Mazed Man" here because somebody had already written an adaptation of either Berzerk or Pac Man called "Maze Man" by the time I wrote this. Although he's completely unrelated, my very first Champions™ character was named Moon Man. I didn't know it at the time, but apparently, there really is a place called Mount Sidney. It's only 1309 feet elevation, though, so there isn't going to be a lot of climbing involved. Page 32: "So powerful that it will ... cause a nearby intelligent person to unknowlingly insult the person next to him" came from a dream I had. It involed a new computer, or digital watch, that would do this. Perhaps this mysterious piece of digital hardware had a hidden Tourette's Ray. 12:15 played a crucial role in an episode of My Favorite Martian. Bill Bixby noticed that Uncle Martin's tabletop timepiece was incorrectly set to 12:00 when in fact the time was 12:15. When Bixby manually changed the clock's setting, he discovered that it was a time machine, because it sent him and Uncle Martin back to 1215 A.D..
You kids these days probably don't remember, but back in the Olden Days, there was actually a phone number called "Time." If you called it, a recorded lady told you what time it was. Depending on who your phone company was, this number was either 555-1212 or 767-2676. I can still hear her voice saying, "At the tone, General Telephone time is ... one ... forty-six ... and fifty seconds — <BEEP!>"
Page 33: You'd think that if Roosky Software were so gung-ho about communism, they wouldn't care so much about making a profit. Page 34: Followers' Adventure was a title I actually completed. A modern Windows port is available on my TRS-80 Adventures page. I don't think I ever intended to write Another Another Star-Trek Game, though. Did I mention that I missed the deadline for getting The Vial of Doom published by the Programmer's Guild by two days? Not that I'm bitter. Page 35: Not only was "Dodgem"/"Crash" a real game that really did serve as the predecessor to Pac Man, a TRS-80 version of Dodgem eventually appeared. It was called Tunnels of Fahad ... and it was almost entirely in Level II BASIC. I can still remember my brother Tim asking me to modify it so that its title screen displayed "TIMMY TUNNELS." Scarf Dude, by the Cornhard dudes, was a play on Scarfman, a real TRS-80 adaptation of Pac Man published by the Cornsoft Group. I don't think Big Five Software ever made a game named anything like Goblin Attack. Send comments regarding this Web page to: Roger M. Wilcox.